Knowing where to start on how to pack for a move can be stressful. There are many factors that go into moving from one place to another. And from planning to prepping to packing, there are just as many opportunities to make a disastrous mistake. Considering the fact that many people consider moving to be more stressful than wedding planning or even divorce, it’s worth taking the steps to ensure you’re prepared before beginning moving. Whether you’re thinking about relocating or have already started the moving process, it’s important to know how to pack for a move. Read on to find out the methods you can use to ensure your move is a little smoother and a little less stressful. Create a moving budget. Moving can be expensive, especially if you aren’t sure how to go about it. From transportation costs to truck rentals, you might end up wishing you had thought ahead before your move. It’s best to start planning out how much you can spend before you even begin packing. That way, you’ll know what you can afford and what’s worth the cost. Decide whether you want to hire a packing service or do the packing yourself, as well as whether you’d like to use a local or long-distance moving service. Put together a packing plan. If you’re wondering how to pack for a move, it’s better to start sooner than later, especially if you have a big family or a big house. Start planning out your packing strategy at least six weeks before the date of your move. This gives you plenty of time to get everything done, and will hopefully prevent last-minute scrambling. You can also organize and label your boxes so that movers deliver them to the right rooms in your new house. This can help prevent any annoying mix ups or confusion once you arrive at your new place. Declutter before you relocate. One of the most stressful things about moving is packing up all of your worldly possessions. Chances are, you have more stuff than you think you do. Decluttering your home before you begin packing can greatly cut down on moving stress, and can make moving into your new house a lot easier. Go through one room at a time to identify items you don’t want to take with you and put them in a donation pile. And remember, charitable donations are tax deductible, so you’ll be happy you decluttered! At White Glove Moving & Storage, our priority is your peace of mind. Now that you’ve put together a moving attack plan, you’re on your way to a successful, stress-free move. 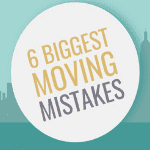 Take a look at our infographic below to read more about common moving mistakes and how you can avoid them.